Recent discoveries by the Kepler mission have shown us that Earth-sized planets are fairly common in the Galaxy. We expect to find several “habitable” planets that are the size and mass of Earth over the next decade, but then what? How do we distinguish between a nice temperate Earth, and an acidic metal-melting Venus? What can we learn about the climates, and even the weather, of exoplanets? Could we identify life, or even intelligence? Presenter: Dr. Thomas Beatty, PhD is a post-doctoral fellow at Pennsylvania State University’s Department of Astronomy and Astrophysics Center for Exoplanets and Habitable Worlds. The meeting will be held at the Science Stage of the Carnegie Science Center. Guest speaker and topic: Featured program is the annual Kevin J. Brunelle Astrophotography Contest. During the meeting, AAAP members’ submissions to the contest will be reviewed and voted upon by the members present at the meeting and winners announced before the meeting ends. The current planetarium was purchased in 2010 by Pittcon as part of Science Week in Atlanta. The societies started offering the planetarium program in 2011 to local school districts in Western Pennsylvania on a first come, first serve basis depending on the schedules of the volunteer society members. Supernovae are the explosions of stars that reach the ends of their lifetime. These awesome events are nearly as bright as the entire galaxy which hosts them. Yet the astronomical community has surprisingly few constraints on the supernova progenitor systems because it is quite difficult to identify the stars before they explode. In this talk I will provide an overview of supernova explosions, with plenty of fantastic images both before and after the stellar deaths, highlighting both the current state of the field and the remaining mysteries. I will incorporate raw data from telescopes I use, including Keck and Hubble. Finally, I will discuss the future of astronomical observations with NASA’s next flagship mission, the James Webb Space Telescope. PLEASE NOTE: Deadline for Dinner Reservations is Wednesday, October 12, 2016 at 12:00 noon. Even though the New Horizons space probe encountered Pluto over a year ago, images and data stored in the craft continues to be received and studied. In addition, New Horizons is pressing on to new objects in the Kuiper Belt. Our guest speaker for the club‟s October 14, 2016 meeting, Mark “Indy” Kochte, brings us the latest with his “New Horizons Update” presentation (see page 7 for Mark‟s bio.). This month‟s meeting takes place in the Carnegie Science Center‟s (CSC) “Riverview Café” which on the ground-level floor on the submarine Requin side of the building (can‟t miss it). Normally we would meet in the Bayer Science Stage or the Buhl Planetarium, but the CSC is also hosting its annual “21+ Night” on the 14th. Also, construction is underway in several areas of the CSC, which limits other possible venues such as the Omnimax Theater. To get to the Riverview Café, go in the main entrance and walk straight ahead where there is an up-ramp to the upper floors and a down-ramp to the Café. Sorry, the Café will not be open to serve food or beverages. Don‟t miss this chance to hear from one of our most interesting and engaging speakers. Dr. James LoPresto returns May 13, 2016 exactly one year after his AAAP lecture on another Solar “Maunder Minimum”. We don’t have Dr. LoPresto’s lecture topic as of Guide Star press time. But we always enjoy his “Sunny” disposition during his lectures. The AAAP is closing in on 90 years in business (in 2019), thus it’s not surprising that we honor several decades-old traditions, including the annual free “Sky Show” at the Carnegie Science Center’s Buhl Planetarium. Of course, the tradition dates back (who knows how far) to the original Buhl Planetarium in the central North Side, and is famous for high attendance and spell-binding shows. 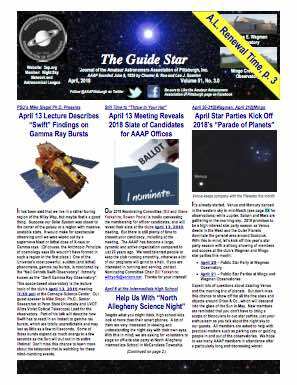 This year’s installment takes place at the club’s April 8, 2016 meeting and features “The Beginner’s Guide to the Universe (Digital Universe)”. According to the CSC’s web site, “Using the stunning graphic capabilities of the Buhl Planetarium, visitors will take a guided tour of the night sky and travel beyond our solar system and even beyond our own Milky Way Galaxy to the farthest reaches of our cosmos.” Here are the logistics of getting everyone up and back from the planetarium for the remainder of the meeting. 1. Please arrive in time for the normal 7:30 pm meeting start in the Bayer Science Stage. 2. We will then proceed en-masse up to the planetarium for the show start. 3. If you have to arrive late for the meeting, you can go directly to the Buhl entrance if everyone has already gone up. However, after the show starts you will not be able to enter the planetarium. Thanks for your cooperation and enjoy the show! PS: The meeting after the Sky Show will include the third installment of Eric Fischer’s “Astronomy Jeopardy”, this time with the planets as the topic on the board.